Born in Saint John, New Brunswick, Canada, Somers grew up near Portland, Maine. At age 18 she moved to New York City to pursue a career in acting, settling in Greenwich Village. Her chosen first name, Brett, came from the lead female character in Ernest Hemingway's The Sun Also Rises. Her chosen last name, Somers, was reportedly her mother's maiden name. After settling in New York she married Robert Klein and had a daughter, Leslie, before their eventual divorce. She married actor Jack Klugman in 1953 and had two sons, Adam and David. Adam shares his July 11 birthday with Brett. Somers and Klugman were long reported to have separated in 1974 but remained legally married until her death. This belief was furthered by the fact that Klugman waited until after Somers died to marry his second wife. However, California records indicate the couple actually divorced in August 1977. Somers became a U.S. citizen late in life. A member of the Actors Studio from 1952, Somers began her career in theater and made many of her initial television appearances in dramatic programs such as The Philco Television Playhouse, Kraft Television Theatre, Playhouse 90 and Robert Montgomery Presents. Her Broadway debut was in the play Maybe Tuesday. The show was a flop and closed after just five performances. She also appeared on stage in productions of Happy Ending, The Seven Year Itch and The Country Girl, the last opposite Klugman. She also amassed a number of film credits including A Rage to Live and Bus Riley's Back in Town. Somers made many appearances on episodic primetime television, including Love, American Style, The Defenders, Have Gun Will Travel, Ben Casey, CHiPs, The Love Boat, Barney Miller and The Fugitive. In 1973 she played Rhoda Morgenstern's Aunt Rose in the season four episode "Rhoda's Sister Gets Married" on The Mary Tyler Moore Show. She had a recurring role as Blanche, the former wife of Oscar Madison (played by real-life spouse Jack Klugman) on the ABC sitcom The Odd Couple in the early 1970s. In 1973 she played Perry Mason's receptionist Gertie on The New Perry Mason, a short-lived revival of the classic TV series, with Monte Markham as Perry Mason. She played the role of Siress Belloby on the 1978 science-fiction series Battlestar Galactica. Somers was best known for her appearances as a panelist on the 1970s CBS game show Match Game. For her debut episode she sat in the lower-left panel position but for the remainder of her tenure she occupied the middle-center seat of the upper tier next to Charles Nelson Reilly, who joined as a regular around the same time as Brett and occupied the top-right seat. She was clearly left-handed as she was always seen writing her answers with her left hand. The show became known for somewhat outlandish and risque dialogue, sometimes being described as a game played at a cocktail party. Somers was a familiar on-screen presence, wearing enormous eyeglasses and various wigs. She played foil to Charles Nelson Reilly, Betty White, Scoey Mitchell, Fannie Flagg and many others. Somers was sometimes the subject of questions on Match Game, such as "You may or may not believe in reincarnation, but listen to this. In a previous life, Brett used to be a ________." Somers was not originally considered for the celebrity panel. When spouse Jack Klugman appeared during the first week of the program in 1973 he suggested that the producers bring her aboard. She remained a regular panelist for the rest of the show's nine-year network and syndicated run. Her appearances on Match Game led radio personality Robin Quivers to impersonate her in parodies of such game shows on The Howard Stern Show. Quivers' impersonation of Somers was featured in the film Private Parts. In 2002 she appeared with Charles Nelson Reilly and Betty White (via videolink) as part of a Match Game reunion on the CBS program The Early Show. She appeared with Reilly on Hollywood Squares during that show's "Game Show Week" in 2002. In 2006 she was a prominent interviewee in The Real Match Game Story: Behind The Blank on GSN and hosted the Match Game DVD as well. She appeared in a cabaret show An Evening with Brett Somers in 2003-04. In 2006 she appeared on PBS Match Game in a special skit created just for her. She joined a special Match Game-esque panel with Dr. Joyce Brothers, Rip Taylor and Wink Martindale. Introduced as a "celebrity look-alike" by Rip, Somers ad-libbed and introduced the correct answer for "Istanbul is Constantinople". She can also be seen on the program's end credits singing "Goodnight, Sweetheart, Goodnight" with the McGuire Sisters and the entire cast. During a 2002 interview Somers denied rumors that she had cancer. She reiterated that point in future interviews. Somers had a naturally husky voice that might have caused the misconception that she suffered from a throat ailment. However, she was diagnosed with cancer in 2004. Following a period of remission she died on September 15, 2007 at her home in Westport, Connecticut at age 83. Her younger son, Adam, gave the cause of her death as stomach and colon cancer. 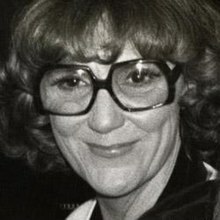 ^ a b "Brett Somers, 83; 'Match Game' regular was a comedian, actress". Associated Press. September 18, 2007. Retrieved March 11, 2017. ^ "Ancestry Library Edition". Interactive.ancestrylibrary.com. Retrieved 2017-03-13. ^ ""California Divorce Index, 1966-1984," database, FamilySearch". Familysearch.org. 15 May 2014. Retrieved 2017-03-13. Audrey Johnston and Jack Klugman, Aug 1977; from "California Divorce Index, 1966-1984"
^ "Citing Los Angeles, California, Health Statistics, California Department of Health Services, Sacramento". Ancestry.com\accessdate=2017-03-13. 2007. ^ a b Michael Portantiere, "Somers in the City" Archived 2007-02-07 at the Wayback Machine, Theatremania.com, July 3, 2003. ^ Garfield, David (1980). "Appendix: Life Members of The Actors Studio as of January 1980". A Player's Place: The Story of The Actors Studio. New York: MacMillan Publishing Co., Inc. p. 280. ISBN 0-02-542650-8. ^ Knopf, Terry Ann. "The Rula Lenska of Game Shows". The Boston Globe. December 14, 1980. "She has been a member of the Actors' Studio for more than 25 years - proudly noting she joined the same year as James Dean." ^ "The Mary Tyler Moore Show, Season 4, Episode 3 Rhoda's Sister Gets Married". TVGuide. ^ Eakin, Marah; Teti, John; Adams, Erik (June 16, 2014). "Bonus round stars: 9 celebrities who found their greatest fame on game shows". The A.V. Club. Retrieved June 20, 2014. ^ PBS Match Game, kqed.org; accessed December 21, 2015. ^ "Actress Brett Somers of "Match Game" fame dies at 83". westportnow.com. September 17, 2007. Retrieved August 29, 2015. Wikimedia Commons has media related to Brett Somers.